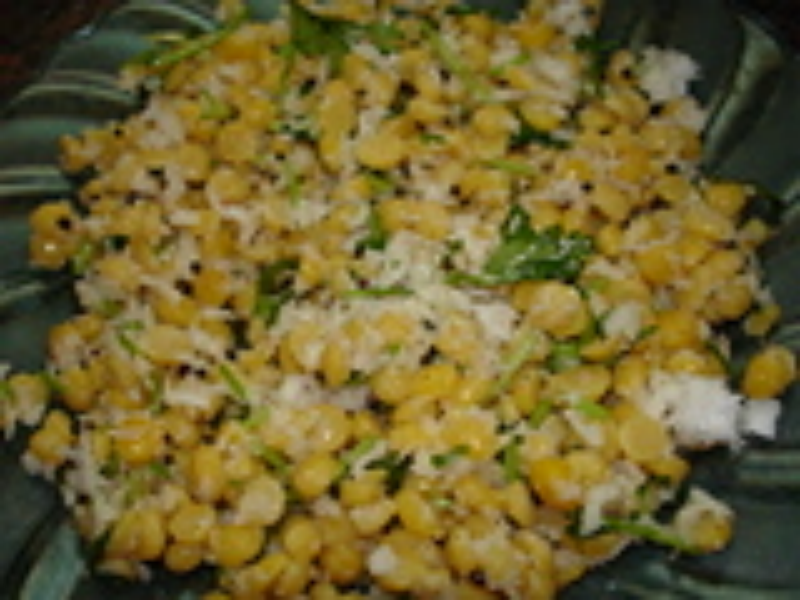 this snack is prepared during dashera festival in tamil nadu. Wash and soak chana dal in water for half an hour. Before pressure cooking add salt and haldi to chana dal and Pressure cook l for 1 whistle.shd not be over cooked.then it will become like a paste while frying. After it cools down,strain the water completely. In a kadai,heat oil and splutter mustard,then green chilli,curry leaves,hing,chana dal,coconut to be added and saute till they are mixed together. Note:Another method:Chana dal can be soaked in hot water for an hour and sprinkle water in the chana dal and steam in cooker for 10 minutes.after it cools down,season it and that time add salt.